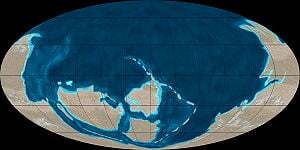 Earth's land and sea distribution in the Early Cambrian epoch about 528 million years ago. During the Cambrian's 54 million years, sea level rose steadily from 30 to 90 meters (98 to 295 feet) above the current level. An approximate timescale of key Cambrian events. The Cambrian explosion took place during the lower Cambrian, but its duration is poorly defined. The Cambrian period is an interval of about 54 million years defined on the geologic time scale as spanning roughly from 542 to 488 million years ago (mya), and being noteworthy as the earliest geologic period in which the fossil record contains clear traces of abundant and diverse forms of multicellular life more complex than sponges or medusoids (jellyfish-like animals). The Cambrian period is the first or earliest of 6 periods making up the Paleozoic era within the Phanerozoic eon, which includes the present time. The Cambrian period lies between the Ediacaran period at the end of the Proterozoic eon and the Ordovician period, the second period in the Paleozoic era. During the Cambrian period, there was an unparalleled explosion of life, as many of the major groups of organisms or "phyla" emerged suddenly, in most cases without evident precursors. (A phylum defines the basic body plan of some group of modern or extinct animals, such as Arthropoda and Chordata.) Some scientists recognize over 50 major phyla that appeared, though a number, including some bizarre body plans, subsequently became extinct. This radiation of animal phyla is referred to as the Cambrian explosion. In the 500 million years since the Cambrian, no fundamentally new body plan has emerged (Mayr 2001). These factors lead to the Cambrian representing a major evolutionary enigma. While various explanations have been given for this phenomena, from rapid evolutionary change to difficult-to-detect pre-Cambrian fossils and microfossils, some maintain that the Cambrian explosion presents a challenge to the wide-spread view that natural selection operating on heritable variation is a viable mechanism for explaining evolution, particularly since the phyla appear so suddenly in the fossil record and the development of new phyla was concentrated in this relatively short time period. The time range for the Cambrian period was for many years set from about 500 mya to about 570 mya, with its lower boundary being set at the earliest appearance of early arthropods known as trilobites and of primitive reef-forming animals known as archeocyathids. The end of the period was eventually set at a fairly definite faunal change now identified as an extinction event. With date inconsistencies as large as 20 million years being common between authors, and with new Fossil discoveries and radioactive dating in the last quarter of the twentieth century offering a new certainty, the traditional dates were called into question, and new dates of circa 545 to 490 mya were proposed by the International Subcommission on Global Stratigraphy as recently as 2002. A radiometric date from New Brunswick puts the end of the first stage of the Cambrian around 511 million years ago, which then leaves 21 million years for the other two stages of the Cambrian. A more precise date of 542 million years ago (plus or minus 300,000 years) for the extinction event at the beginning of the Cambrian has been submitted and it has been accepted by many scientists. The rationale for this precise dating is interesting in itself as an example of paleontological deductive reasoning. Exactly at the Cambrian boundary, there is a marked fall in the abundance of carbon-13, a "reverse spike" that paleontologists call an excursion. It is so widespread that it is the best indicator of the position of the Precambrian-Cambrian boundary in stratigraphic sequences of roughly this age. One of the places that this well-established carbon-13 excursion occurs is in Oman. Amthor (2003) describes evidence from Oman indicating that the carbon-isotope excursion relates to a mass extinction: The disappearance of distinctive fossils from the pre-Cambrian coincides exactly with the carbon-13 anomaly. Fortunately, the Oman rock sequence also includes a volcanic ash horizon from which zircons (zirconium silicates) provide a very precise age of 542 ± 0.3 Ma (calculated based on the decay rate of uranium to lead). This new and precise date tallies with the less precise dates for the carbon-13 anomaly, derived from sequences in Siberia and Namibia. It is considered likely to become accepted as the definitive age for the start of the Phanerozoic eon, and thus the start of the Palaeozoic era and the Cambrian period. Cambrian continents are thought to have resulted from the breakup of the neoproterozoic supercontinent called Rodinia. The waters of the Cambrian period appear to have been widespread and shallow. It is thought that Cambrian climates were significantly warmer than those of preceding times, which experienced extensive ice ages, especially during the Varanger glaciation in an interval of up to 160 million years extending from about 630-790 mya. Continental drift rates in the Cambrian may have been anomalously high. Because of their complexity, it is difficult to describe continental motions in text. Time-sequenced maps of paleo-continents and other major geologic features are called paleomaps. Fossil trilobite Redlichia chinensis from the Cambrian of China. Aside from a few enigmatic forms that may or may not represent animals, all modern animal phyla with any fossil record to speak of except bryozoa (tiny, aquatic, and mostly sessile and colonial animals) appear to have representatives in the Cambrian period. Of these, most except sponges seem to have originated either just before or just after the start of the period. In addition, there are several modern phyla whose small and/or soft bodies have left no fossil record at all, either in the Cambrian in any other period. Many extinct phyla and odd animals that have unclear relationships to other animals also appear in the Cambrian rock strata. The apparent "sudden" appearance of very diverse faunas over a period of no more than a few tens of millions of years is referred to as the Cambrian explosion, as discussed below. The best studied sites where soft parts of organisms have fossilized are in the Burgess shale of British Columbia. They represent strata from the middle Cambrian and provide a wealth of information on early animal diversity. Similar faunas have subsequently been found in a number of other places—most importantly in very early Cambrian shales in China's Yunnan Province. Fairly extensive pre-Cambrian Ediacarian faunas have been identified in the past 50 years, but their relationships to Cambrian forms are quite obscure. The Cambrian explosion refers to the geologically sudden appearance of complex multi-cellular macroscopic organisms between roughly 542 and 530 million years ago. This period marks a sharp transition in the fossil record with the appearance of the earliest members of many phyla of metazoans (multicellular animals). Since the Cambrian, no new major body plans (phyla) have come into existence, and some phyla, such as the arthropods, exhibit a preservation of body plans sustained to the present for not only phyla, but also classes(Mayr 2001). Gould (2002) maintains that all major bilaterian phyla with fossilizable hard parts make their first appearance in the fossil record at this time within the remarkably short interval of 5-10 million years, but probably nearer the lower value. The sole exception is the Bryozoa, which appear later, in the Ordovician period. The "explosive" appearance of so many phyla, and the fact that no fundamental new body plans have since come into existence, represents an historical enigma. Some maintain that the explosive radiation of forms resulted from rapid evolutionary change and from the limits of previous technology to appreciate microfossils, which formed the foundation of the fossil record before this time. Some explain the phenomena as a result of a fragmentary fossil record for earlier periods and the possibility that the pre-Cambrian ancestral organisms were soft bodied. Molecular evidence suggests that at least six animal phyla may have established themselves as distinct evolutionary paths during the Precambrian (Wang et al 1999), and some view the Cambrian explosion as the macroscopic conclusion to a prolonged period of evolution that began approximately 30 million years earlier with the innovation of multi-cellular organisms. Others, however, maintain that the Cambrian explosion presents a challenge to the neo-Darwinian theory of evolution. Wells (2000) sees the challenge not in the abruptness of the event, nor in its extensiveness with so many new phyla, but the fact that the phyla appeared right from the start. There is a lack of ancestral forms or intermediaries, despite good sedimentary rocks from the late Precambrian, and the fact that soft-bodied fossils are known from the Precambrian and Cambrian. As eminent evolutionist Stephen Jay Gould (2002) notes, "[confirmation of] the absence of complex bilaterians before the Cambrian explosion rests upon extensive examination of appropriate sediments replete with other kinds of fossils, and located on all continents." For example, even though the Ediacaran fauna (about 600 million years ago) are soft bodied, they have been preserved as fossils on all continents, while hard-bodied (or even soft-bodied) bilaterians are generally not found (although some bilaterian presence was found in late Precambrian times, but not like that of the Cambrian explosion). Prior to the discovery of the Cambrian explosion, such an abrupt appearance of new body types would not have been an obvious prediction emanating from the theory of evolution by natural selection. Rather, the more likely expectation would have been the gradual development of new phyla, as organisms diverge from one another with an increasing diversity and complexity of major body plans. The difficulty of readily explaining this phenomena might be one explanation for the puzzle that the Burgess Shale, one of the main finds for the Cambrian explosion, was first discovered by Charles Walcott in 1909, yet was not reported to the public until the late 1980s. More recent microfossil finds have shown "Pre-Cambrian" life comprising more than single- celled organisms or simple diploblastic(having two embryonic cell layers) fauna. In 1994, phosphatized triploblastic (having three cell layers) embryos were discovered in rocks from southern China dated to 570 million years ago(Xiao et al 1998). This period of evolution is source to some of the most unusual fossils ever recovered. A single formation, the Burgess shale, has provided some of the best insights into this period of dramatic evolutionary change and experimentation that laid the foundation for most major modern animal body plans. Also appearing at this time is a wide variety of enigmatic and exotic configurations that appear to be unrelated to any modern animals. Fossils from the Chengjiang biota, about 10 million years older than the Burgess Shale, have given both a broader and sharper view of early Cambrian life. Before the explosion, the fossil record is dominated by single-celled organisms with only the rare soft-bodied Ediacaran fauna and certain microfossils showing that multi-cellular life forms had arisen roughly 30 million years earlier (Xiao et al 1998). With the Cambrian explosion came the appearance of shells and other hard body parts. As shells are more easily preserved in sediment than soft body parts, this makes life forms of this and subsequent periods much easier to study in the fossil record than their Precambrian counterparts. The Cambrian explosion may have been precipitated by several environmental changes occurring in and just before this period. First the Varangian glaciation gave rise to a Snowball Earth in which all or nearly all of the oceans were covered entirely with ice. This was followed by a deglaciation and rapid global warming just before the beginning of the explosion itself. In modern Arctic environments, single-celled organisms often form mats on the underside of ice sheets in order to maximize their exposure to sunlight. It is possible that adaptations useful to the maintenance of such colonies also assisted in the formation of the first triploblastic animals estimated to be 570 million years of age (Xiao et al 1998). In addition, the Snowball Earth environment would have given rise to relatively few ecological niches, so the subsequent deglaciation and global warming may have provided the impetus for rapid evolution to fill many new environments. Amthor, J. E., et al. 2003. “Extinction of Cloudinia and Namacalathus at the Precambrian-Cambrian boundary in Oman.” Geology 31: 431-434. Gould, Stephen J. 2002. The Structure of Evolutionary Theory. Cambridge, MA: The Belknap Press of Harvard University Press. International Commission on Stratigraphy (ICS). Homepage. Retrieved November 10, 2008. Mayr, E. 2001. What Evolution Is. New York, NY: Basic Books. Wang, D. Y., S. Kumar, and S. B. Hedges. 1999. Divergence time estimates for the early history of animal phyla and the origin of plants, animals and fungi. Proceedings of the Royal Society of London, Series B, Biological Sciences 266: 163-71. Wells, J. 2000. Icons of Evolution: Science or Myth? Washington, DC: Regnery Publishing. Xiao, S., Y. Zhang, and A. Knoll 1998. Three-dimensional preservation of algae and animal embryos in a Neoproterozoic phosphorite. Nature 391: 553-58. This page was last modified on 1 April 2013, at 20:39.